Dr. Angela Fung received a BSc with First Class Honours and PhD in Biochemistry from the University of Alberta in Edmonton, Alberta. 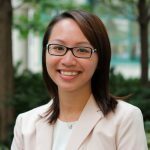 Her interests in clinical applications of biochemistry and mass spectrometry have led her to pursue clinical chemistry post-doctoral fellowship training. She completed a Clinical Chemistry fellowship at the University of Toronto. Upon completion of her training, she joined the Department of Pathology and Laboratory Medicine of Providence Health Care as a Clinical Chemist. Her current research interests are biomarker discovery, clinical assay development, and clinical applications of mass spectrometry.